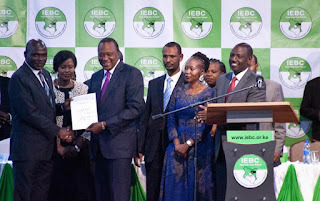 Kenyan electoral official Roselyn Akombe, center right, stands as President Uhuru Kenyatta, third from left, receives his electoral win certificate, later nullified, from Chairman of the Electoral Commission Wafula Chebukati, left, as Deputy President William Ruto, right, looks on at the results center in Nairobi, Kenya. Akombe resigned Wednesday, Oct. 18, 2017 in a statement from New York saying the rerun of the presidential election scheduled for Oct. 26 cannot be free and fair. NAIROBI, KENYA (AP) — It is "difficult to guarantee a free, fair and credible election" in Kenya's fresh presidential vote just eight days away despite "full technical preparedness," the head of the election commission said Wednesday as another wave of uncertainty swept through East Africa's largest economy. Wafula Chebukati spoke hours after a top Kenyan electoral official resigned and fled to the United States, saying the election on Oct. 26 cannot be free and fair. "Not when the staff are getting last-minute instructions on changes in technology and electronic transmission of results. Not when in parts of the country, the training of presiding officers is being rushed for fear of attacks from protesters," said Roselyn Akombe, who had been a commissioner on the electoral board. Speaking to The Associated Press from New York, Akombe said she fled out of fear for her life. 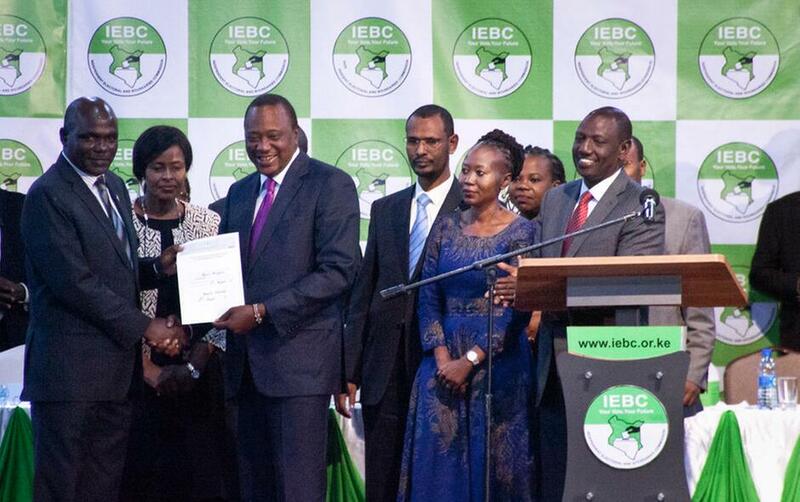 The Supreme Court last month nullified the August election in which President Uhuru Kenyatta was declared the winner, citing irregularities, and ordered a fresh one. Kenyans woke up to the latest news in shock. Many opposition supporters backed Akombe's decision, while ruling party supporters accused her of attempting to sabotage elections. Protesters in the opposition stronghold of Kisumu city in western Kenya threw chairs and destroyed tents where an election training camp was being set up for officials. "There is no way we are going for an election where the referee is partisan," said Kisumu's deputy governor, Mathews Ochieng Owili. Opposition leader Raila Odinga, whose legal challenge of vote-rigging led to the ruling, last week withdrew from the new election because electoral reforms had not been made. Among them, he wants some election commission staffers to be replaced. Chebukati said he had tried to make critical decisions to reform the election commission but each time was overruled by the majority of commissioners. "Under such conditions it's difficult to guarantee free, fair and credible elections," he said. "Without critical changes in key secretariat staff, free, fair and credible elections will surely be compromised. I therefore call on the staff adversely mentioned to step aside." Chebukati also praised Akombe's work, saying she was driven by nothing else "other than the love of her country and wanting to see democracy thrive in Kenya." Odinga on Tuesday suspended opposition protests intended to press for reforms, citing the killings of his supporters by police. Amnesty International and Human Rights Watch this week said 67 opposition supporters have been killed in protests since the results of August's election were announced.